Applied Behavior ANALYSIS (ABA) is an evidence-based method of teaching which uses rewards (i.e. reinforcers) to help teach appropriate behaviors and responses to children. 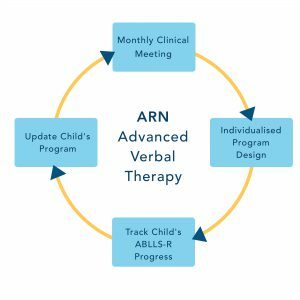 Our Advanced Verbal Behaviour Therapy is a progressive and holistic approach to ABA (Applied Behaviour Analysis) treatment. It is an effective and scientifically proven educational process that is steered by your child’s learning needs and goals. Instruction is specifically adapted for your child to maximise his or her benefits from our programs. Therapy hours provided for a child may range from 15 hours to up to 40 hours. Lessons are usually arranged in 3-hour sessions. Typically, duration of treatment is around 2 years. The hours needed depends on the specific learning needs and goals of your child. Our Individualised Educational Program for your child follows the ABLLS-R (Revised Assessment of Basic Language and Learning Skills) curriculum and focuses on enabling your child to acquire critical communication, learning and functional skills. These skills are just some of the 544 important skills from 25 skill areas including language, social interaction, self-help, academic and motor skills, that we help your child pick up so he or she can succeed in school as well as in life. Comprehensive and holistic curriculum individualized to your child’s learning needs. Facilitating learning through engaging activities. Tracking your child’s progress through ABLLS-R.
Our supervisors monitoring your child’s progress every week. Monthly meetings to review your child’s IEP and adjust the curriculum accordingly. Our therapists can also travel to your home to carry out the 1 to 1 Programme for your child. The home programme focuses on teaching within your child’s natural environment as well as training family members on how to teach your child effectively.